Living in California, specifically the San Francisco Bay Area, you lose the stark contrast of seasons. Winter is the time when my lawn is green and in summer my grass dies and turns brown (I should probably water it more). Our magnolia tree loses it’s leaves during the summer and blooms in the autumn and winter. And generally the seasonal changes are soft and gentle, distinct, but subtle. I am presently in the middle of a two week visit to the heartland of America, I am in Michigan. Michigan seasons are not subtle. You cannot ignore the oncoming autumn, nor the incoming winter. 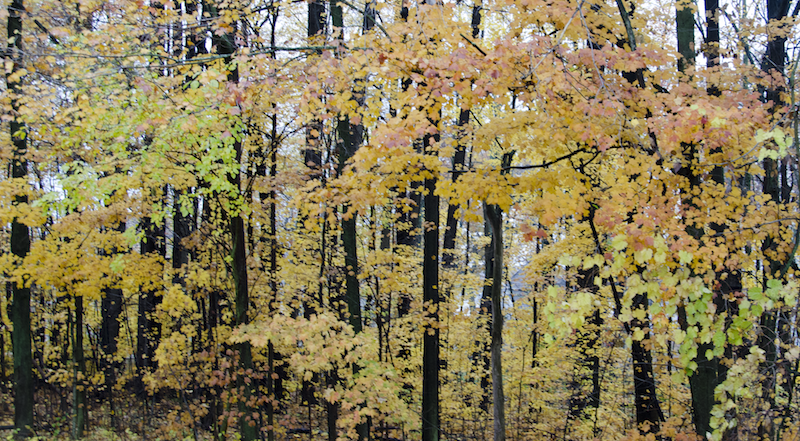 Viewing the autumn colors and feeling the cold in the air, I am reminded directly of the natural order of things. It is powerful seeing the changing of the seasons again. The awareness of just how little control we have over nature. Everything is either dying or going into a deep state of hibernation and sloughing off everything not needed to survive through the long cold winter. Rains come almost daily, and we experienced a good old heartland thunderstorm this week. I sure do miss seeing a good storm! I cannot stop the leaves from falling from a tree. I cannot hold onto summer. I cannot change the weather. It is wonderfully liberating to remember there are things beyond my control. Remembering that I can, and must, let go and allow nature to take it’s coarse. Please don’t misread me, there are many things in my life in California completely beyond my control. But I frequently forget. Often the lapse in memory works to my detriment as I stress over the changing of the tides. I foolishly waste energy in my attempt to manage the unmanageable. 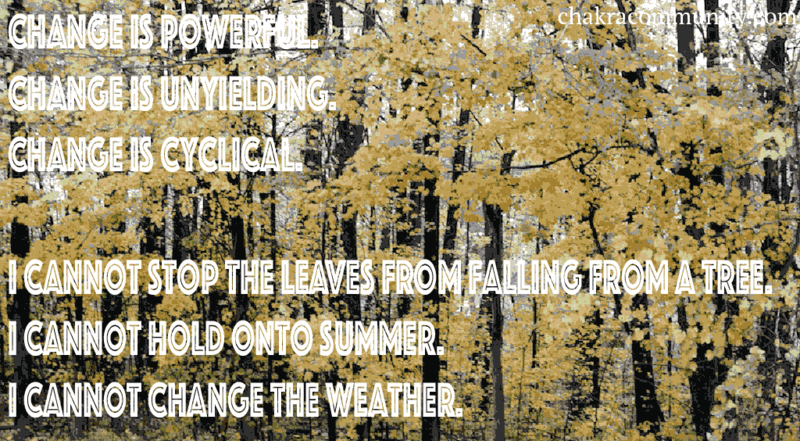 It is so easy to burn up valuable resources trying to resist change, to hold back the seasons. As change approaches you this autumn I invite you to welcome it. Remember it’s only a phase. Change will come and change will go, and if we’re lucky, we’ll learn a little something in it’s passing.